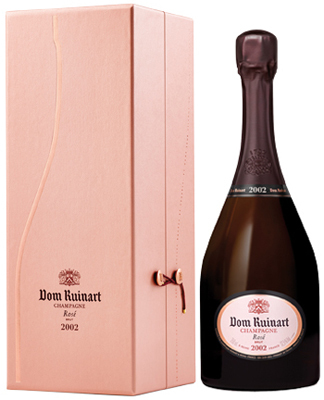 Dom Ruinart Rosé 2002 presents a vibrant colour, a deep coral with delicate coppery tones. The primary aroma of this vintage champagne is surprisingly intense and complex; notes of exotic fruits (guava) and citrus (blood orange, citron) intermingle with floral aromas such as violet and rose, with a touch of musc. Allowing it to breathe reveals notes of allspice followed by orange blossom, brioche, orgeat, with a base of perfectly ripe red fruits. The richness of the 2002 vintage boasts exceptional breadth and volume on the palate. It offers a fine fruity, floral and spicy aromatic range. The low dosage leaves a final flourish of great purity, expressing the nobility of the grand crus making up this cuvée. Dom Ruinart Rosé 2002 offers a fine and persistent effervescence. Dom Ruinart Rosé 2002 will complement to perfection savoury dishes such as soy-glazed squab, wild duck with chanterelles and morello cherries, or even a slow-cooked veal cutlet accompanied by risotto al radicchio. Without question, longer ageing in the cellars will rank it amongst the greatest Dom Ruinart Rosé vintages such as the 1996, 1990, 1988 or the legendary 1976. The 2002 vintage was characterized by mild, dry weather. Both spring and summer experienced wonderful sunny periods. Even though there was rain at the end of August, the dry wind and fine weather which arrived in September made it possible for the grapes to ripen in excellent conditions. Just the right amount of sunshine throughout September meant that the harvest was perfectly ripe while maintaining a very good level of acidity. The late season was also favourable for crafting excellent red wines; smooth and concentrated. The blend was made using 80% Grand Cru Chardonnay - 72% from the Côte des Blancs (Avize, Cramant, Le Mesnil-sur-Oger) and 28% from the Montagne de Reims (Puisieulx, Sillery) - and 20% Pinot Noir made into red wine, from the Sillery and Verzenay crus.